There are more than 200 viruses known to cause the common cold, and it is impossible to avoid them completely, but there are steps you can take to reduce the chance of and you and your family becoming infected. This is definitely rule number one. The CDC (United States Centers for Disease Control and Prevention) says the simple act of hand washing is the single most important means of preventing the spread of viral and bacterial infections. It’s well worth getting into the habit, especially after using public toilets, before preparing a meal or grabbing a snack. Remember to use warm water and soap and take your time – proper hand washing means rubbing your hands for at least 15 seconds. If you do not have access to water, a disinfectant hand gel will work as well. If a person in your surroundings gets a cold, take additional precautions. Keyboards, light switches, telephones, door knobs, drawer handles and remote controls can all harbour viruses for hours, so wipe them frequently with a disinfectant solution. Use paper towels for hand washing instead of cloth ones. Easier said than done, especially if you travel by public transport or work as a teacher. At least try to avoid people who you know have a cold or the flu and stay away from crowded areas whenever you are able to. Staying warm and dry won’t prevent a cold, but it might reduce the likelihood of symptoms such as coughing and sneezing when you do get infected. You can enhance your body’s natural resistance mechanisms by making sure you eat nutrient-packed, toxic-free foods, take physical activity and get proper rest. 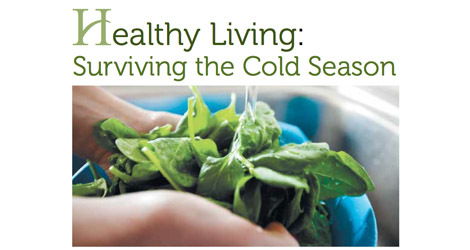 Nutrition experts claim that eating the right foods can help prevent colds or the flu. The key is not waiting until you get sick to make these changes; you need to revamp your diet and lifestyle before the cold and flu bugs get to you. Foods are better than supplements for the prevention of infections because you get the whole nutritional package. Fruits and vegetables are not only great sources of vitamin C, but also other vitamins, minerals and flavonoids that work alongside vitamin C to keep your immune system healthy. Everyone needs at least five servings of fruit and vegetables every day to maintain a healthy immune system. Incorporating natural juices and green shakes into your diet is a good way to increase your daily intake of crucial nutrients. Frozen fruits and vegetables are another economical and convenient way to Improve your diet. There is strong evidence that people who exercise don’t get sick as often. Exercise is important all year, even during the dark and cold of winter. It’s good a have a plan to keep active which includes activities such going to the gym, doing yoga or walking on a treadmill. Lack of sleep weakens your natural defences considerably. Last but not least: remember that there is no preventive medicine like happiness! Taking good care of your spiritual and emotional life helps prevent not only colds and the flu, but a whole range of other health problems. Życzę zdrowia! And what about olive oil? The health benefits of olive oil are unrivaled, and research reveals more benefits nearly every day. In fact, we are only just beginning to understand the countless ways olive oil can improve our health, and our lives. Olive oil is the cornerstone of the Mediterranean diet; an essential nutritional mainstay for the world’s longest-living cultures.